Caramel apple cheesecake, anyone? This decadent dessert will please any holiday goer! 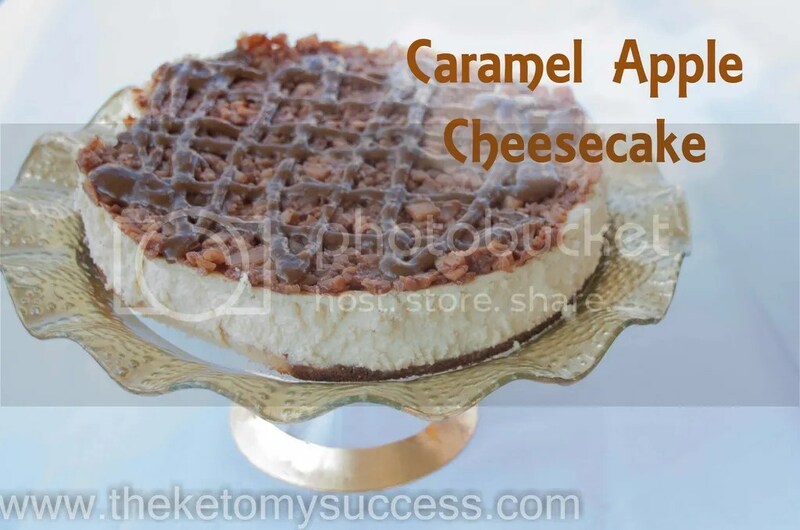 A rich caramel cheesecake slathered in caramel “apples” and a luscious caramel sauce. The secret is the jicama. When you chop it finely and microwave it to soften it, you get a healthy alternative to an apple. Apples have too much sugar and thus carbs for those on a ketogenic diet. When you add the sweetener and spices, you will not miss that fall staple. Perfect for any holiday party or event. Enjoy! Preheat oven to 350F. Line the bottom of a spring form pan with parchment paper. Also butter the sides of the pan. Wrap the outside of the pan in two layers of aluminum foil so that it is water tight. Add the softened cream cheese and sweetener to a stand mixer. Cream them together until smooth. Add the eggs, one at a time, until incorporated. Add the vanilla and caramel syrup to the mixture. Once the crust is completely cooled, add the cheesecake to the spring form pan. Place the spring form pan onto a baking sheet. Place in the oven and slowly add hot water onto the baking sheet. You will want the water about halfway up the side of the baking sheet. Bake the cheesecake for 1 hour. It will still be a little jingly in the middle but will firm up once it has cooled completely. Refrigerate the cheesecake for an minimum of 4 hours, preferably overnight. Finely chop 1 cup of jicama. Place in a medium bowl, cover in plastic wrap and microwave for approximately 10 minutes. Place the softened jicama in a medium saucepan. Add the remainder of the ingredients and bring to a low simmer over medium-low heat. Stir constantly to avoid burning the jicama and sweetener. In a small sauce pan over medium heat, add the butter, Swerve, and molasses. Stir constantly for 3-5 minutes, careful not to burn the mixture. Remove the pan from the burner and add the heavy whipping cream, xanthan gum, and salt whisking briskly to dissolve the xanthan gum. Put caramel sauce back on the burner and simmer for an additional 1-2 minutes. Again, remove from the heat and add 2 tbsp. water and additional salt (for salted caramel sauce). Mix to combine. Let cool to room temperature. Once cheesecake has been refrigerated for a minimum of 4 hours, top it with the apples and drizzle with the caramel sauce.